Nora Ventosa and Simó Schwartz, Scientific Directors of NANBIOSIS units 6 and 20 moderated the plenary session devoted to New therapeutic strategies for lysosomal disorders, in which the speakers presented their findings regarding biomarkers, genetic variants and treatment protocols. Ibane Abasolo presenting the talk about the Smart4Fabry project. 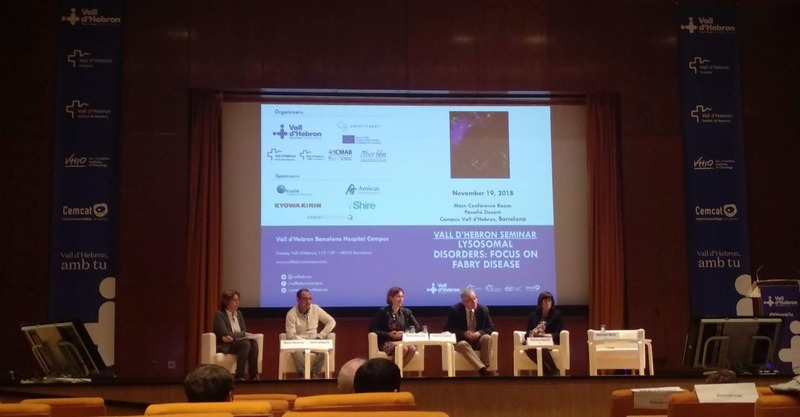 Ibane Abasolo, Scientific Coordinator of NANBIOSIS Unit 20 from Vall d'Hebron Research Institute, gave a talk about the project Smart4Fabry: Nanomedicine in lysosomal disorders. Project Smart4Fabry .The Smart4Fabry project, coordinated by Dr. Nora Ventosa from ICMAB-CSIC and CIBER-BBN, and with the participation of NANBIOSIS units U3 Synthesis of Peptides Unit, U6 Biomaterial Processing and Nanostructuring Unit and U20 Functional Validation & Preclinical Research (FVPR), was described in the course of this specific day on lysosomal diseases and Fabry’s disease. Photos by Judit Tomsen, ICMAB-CSIC.